I visited Estes Park for the first time in August 2016 as part of my post-bar trip (as in the exam law students take to become attorneys, not the drinking establishment kind). My fiancé and I planned a road trip from Texas to the Grand Canyon then up to Colorado. We stayed at Estes Park for two days before heading to Boulder to visit some of my fiancé’s family. My second visit was over Labor Day weekend this year (2017). Our goal was to summit Longs Peak. I chickened out as I read more about the last stretch of the climb, but still made it to they Keyhole (13,700 ft elevation). This post is a compilation of these two visits, our hikes, where we stayed and ate, and the scenic route to the Alpine Visitor’s Center. Frontier Airlines has direct flights from San Antonio to Denver and is one of the cheaper airlines. Although it’s improving, there aren’t many direct flights out of SA’s Airport (usually there’s a layover in Houston) so we decided to try Frontier and cut down on our travel time. It’s definitely a no fuss-no muss airline. And for short flights like this one (around 2 hours), that worked out pretty well. The seats don’t have a lot of padding or extras so the seats in the front of the plane, where we were, actually had quite a lot of room (compared to flights I’ve been on recently). The downside is that a lot of things we’ve grown accustomed to are considered extras (though this seems the way a lot of airlines are heading nowadays). Checked bags cost extra, carry-on luggage (not personal items) costs extra, snacks and drinks cost extra (though I’m not sure about water). If we were on a longer flight or if we had to bring luggage, then we may have chosen another airline. But for this trip it worked out great. My fiance’s parents were also staying in Estes Park. They drove to Colorado and offered to take our luggage with them. Saved us the extra luggage fee. We arrived Thursday night and planned on summitting Longs Peak on Sunday. So, on Friday we decided to hike some of the Longs Peak trail to familiarize ourselves with the terrain and to acclimate ourselves to the elevation. The trail head starts at an elevation of 9,405 ft and we had just come from around sea level. The beginning of the hike is fairly easy, not too steep. We could feel the elevation difference, though. We had to focus on breathing deep and took a few more breaks than we’d normally need. About 0.5 miles in, you’ll reach the first trail post. You can either take the path on the left towards Longs Peak and Chasm Lake, which is what we did, or take the path on the right and head towards Eugenia Mine, Moore Park, Storm Pass and Estes Cone. The longest destination to the right is Estes Cone with a 2.7 mile hike. Long Peak, on the other hand is 7.0 miles. During the first portion of the hike you’ll be able to hear rushing water and see a small cascade. Around the 2.0 mile mark you’ll discover where the water is flowing from. The Alpine Tundra (as I call it because there’s a sign for this area of the trail) has a large, beautiful cascade surrounded by pine trees and wildflowers. Its a great spot to stop and take photos, or eat a snack if you’re feeling hungry. There is a bridge made out of a log placed across the top of waterfall for hikers to cross. I’m glad we saw it during the daylight because it made the crossing easy during our morning hike in the dark. I couldn’t imagine crossing that waterfall without being able to see it. Continuing on, it wasn’t too long before we were above treeline, around an elevation of 10,700 feet. The trees become more like shrubs and you can finally see the mountain ranges on the horizon. As you follow the path, trees and shrubs disappear and are replaced by rocks and small flora. With all of the rocks its easy to lose the trail on your way up the mountain (its easier to follow on the way back down). There are cairns along the path to help you keep on track. These are typically built by other hikers. Since this area is flatter, the cairns are pretty large (you’ll notice the higher you go in elevation the smaller the cairns…maybe too much effort?). We may have gotten off the path once here, but it was easy to find again. Not only are there cairns, but there’s usually several other hikers along the trail to help guide you in the right directions. The path leads over a “hill” and from here we could see snow in a field that hasn’t quite melted away yet and ponds created by the snow that has melted. One hiker pointed out a moose that was just chillin’ in one of the ponds (hopefully he wasn’t stuck). I wish I had a better lens because I couldn’t take a good picture of him. But i packed a light weight lens with no zoom. Sigh. Anyways, beyond the “hill” is the junction for Chasm Lake and Granite Pass. If you plan on summitting, you’ll reach this point of the trail in the dark. This is what it looks like during the day if you don’t plan on hiking the trail before your summit day. It’s here you’ll find the first bathroom/privy on the trail! By the time we reached the junction it was nearly 4 PM, so we couldn’t keep hiking much longer. We decided to head towards Chasm Lake instead of going up the Granite Pass. It was about 2 miles to the Chasm Lake from this point and we thought we’d have time to get there and back. But its not an easy 2 miles if you’re trying to move quickly. So we only made it to Peacock Lake, a smaller version with a tiny waterfall. We went a little further from where my fiance is standing in the photo above. From where we stopped we could see some of the trail we would have taken to Chasm Lake. There’s some rock scrambling and narrow points. You’d walk just above the waterfall and over that ridge. Instead, we took a short break to eat a snack before making our way back down the mountain. We had dinner reservations at Mary’s Lake Lodge. For more information on where we ate dinner, scroll down. The next day we drove up to the Alpine Visitor’s Center. But before I get to that, I’ll head right in to our Summit Day Hike! My fiance, his dad, and I woke up at 1 AM, finished packing our gear, ate as much food as possible, and loaded up the truck. My fiance’s mom drove us to the trailhead. If you plan on summiting Longs Peak, you need to start from the trailhead around 2 or 2:30 AM. We left the parking lot at 2:30 AM. If you aren’t getting dropped off, you’ll either need to get there earlier to park in the parking lot, or plan on parking along the road further down the mountain and factor in extra time for reaching the trailhead. Since we had hiked some of the trail a few days before, it seemed to go by a lot quicker the second time. Partly because it was dark and there was nothing to look at except the ground in front of you, and partly because we had acclimated ourselves. Even so, we were passed by several people. You’ll see a wide variety of hikers, too: some younger, some older, some in shorts, some in layers, and maybe even one who opted for no shoes (I don’t recommend that). We took our first break at the Water Fall. It only lasted maybe 5 minutes, long enough to eat some food. We each had a water bladder in our bag so we were able to drink water as we went, rather than needing to on a break. If you’ve never done one of these hikes, your breaks should be short and you’ll want to put a jacket on if they’re longer than 2-3 minutes. We didn’t stop again until we reached the junction point at Chasm Lake and Granite Pass. We found a large boulder to sit behind to block the wind. We ate some more food, went to the restroom, and I took this break as an opportunity to take a long-exposure photo of the night sky. It’s a great spot to look up and star gaze. Next part of the hike is the Granite Pass. Below is a photo of what it looks like. And its exactly like how it sounds: a passage of large granite blocks. Since we didn’t get this far during our hike on Friday, I thought the path was a long an edge. Turns out, not so much. I slipped at one point (the entire hike is rocky) and was a little freaked out because I thought I could have fallen off a cliff, but nope. I would’ve been fine. You should still be cautious. As we reached the top of Granite Pass, the sun was starting to rise. As the sun peeked out from the haze, we passed from one side of the mountain the other. This section of the Granite Pass is flatter, with switch backs. As you walk further up the side of the mountain, Longs Peak comes into view. We took decided to take our third break here, so we could watch the sunrise and take plenty of photos. It was still a little cold, but at least now we could see where we were going. Finally, we made it to the Boulder Field. While walking through the Granite Pass, I thought we had reached the boulder field because the terrain was spotted with large boulders. Once again, I was wrong. You’ll know when you reach the Boulder Field. It’s aptly named. Here is where you can camp, if you’re lucky to get a reservation. The tents are surrounded by walls of boulders to block the cold wind. I don’t think you can light fires but you may be able to pack a small stove. If you plan on camping in any of the location on Longs Peak, you’ll want to check this because it’ll probably determine how many layers you pack. The Boulder Field is also where the bathrooms are located. It’s your second and last chance to use a restroom before making your final ascent (its roughly 4-6 hours to the summit and back so I recommend using these!). After another break we started the daunting task of hiking through the boulder field. Climbing over these large boulders for nearly a mile is a bit monotonous and hard on the knees. I used my trekking poles to help keep my balance and I stepped from one boulder to the next until the elevation starting rising. At one point you’ll want to put the trekking poles away so you can use your hands for balance or to lift yourself up. I remember thinking through this stretch, “This isn’t even the toughest part,” as I felt myself getting tired. Note that there is no right path to take through the boulder field. As long as you stay near the center and keep the keyhole in front of you, you’ll find your way. As you reach the Keyhole, the climb becomes steeper. I started getting anxious and kept thinking, Don’t fall backwards. I’m glad I had already decided not to go further than the keyhole. If I started having fear of heights now there was no way I could make it down the Narrows and beyond. But I had to at least make it to the keyhole. I hugged the wall and my fiance helped me up to the ledge. There’s enough room to sit down, but not a lot of room to move around much. One one side is the boulder field, and on the other side is a valley surrounded by mountains. Its extraordinary, massive, and you feel like you’re sitting on top of the world…almost since the top is still another 1-2 miles further. The Keyhole is only 13,200 feet in elevation. I sat at the keyhole only long enough to snap a few pictures of the view, my fiance, his dad, and one of me with my fiance. Then I had them help me back down. I sat on a flat boulder, waiting for the guys below me to move so I could take their prime location below where I sat. I also held onto my fiance and father-in-law’s trekking poles, extra food, and heavier jackets so they wouldn’t have as much to carry on their way to the summit. For those of you who plan on summitting Longs Peak, I recommend you find other blog posts or stories from other hikers to discover what is entailed and what you need to do to prepare for it. Check out my resources at the end of this post for a starting place. It’s not an easy climb and you’ll want to be prepared. All I know is that once you are at the keyhole, you’ll head between two boulders to continue on the path (the one the right of the path has a black line). While I waited for my fiance and his dad (for a bit longer than expected) I talked with a few other hikers, took pictures every hour, and made sure I was applying ChapStick and sunscreen every hour. It is very important to wear sunscreen at this altitude. I missed a spot on my chest and was very red! I saw one guy take off his shirt and lay down on a boulder as he waited for some friends to return from the summit. Lucky for him someone asked what time it was. Once he realized it was noon at 14,000 ft he decided to put all his layers back on. At the Keyhole there is a small shelter. It can be used to get out of the sun, to sit and rest, but more importantly if a thunderstorm forms on the mountain and you need somewhere to get out of harm’s way. I hugged the wall near the shelter as I made my way up to the Keyhole. The shelter is known as the Agnes Vaille Shelter and has a plaque on the outside of the building. Agnes was the first woman to climb Longs Peak in the winter of 1925. One her descent, she slipped and fell 150 feet. in the vicinity of the Keyhole. Her hiking partner went to find help, but she fell asleep and froze to death before he returned. Luckily we had no need for the shelter. It was sunny and dry all day, perfect weather for reaching the summit. Thunderstorms are extremely likely to occur during the afternoon on the mountain, so keep an eye on the weather and turn around if storms begin to form. It can be extremely dangerous beyond the boulder field and you do not want to get stuck beyond the keyhole in a storm! Eventually my party arrived back at the keyhole. They took a short break as they gathered strength to make it back down to through the Boulder Field. I had been watching people make this trek for the past few hours so I knew it was a lot faster going down than up. Once we reached the campground we used the restrooms one last time. Since they descended later than originally planned we had to move pretty fast to try and get off the mountain for sunset. We took two breaks on our way back down. The first was at the Granite Pass so I could take pictures of what it looked like in the daylight. Have you reached the summit of Longs Peak? If so, comment below and share your experience and tips for the hike! When we arrived at Estes park in 2016, we were extremely sore from our hike into the Grand Canyon the day before. Driving all day after that hike was not a good idea, our muscles were pretty stiff when we got out of the car upon arriving at Mary’s Lake Lodge. The next day we had planned on doing some real hiking, but had to settle for a more leisurely hike. We drove beyond the Longs Peak Trailhead and stopped at the Wild Basin Trailhead. We went late enough in the day so that the parking lot wasn’t too full. A lot of visitors were starting to leave by the time we got there. There were two main attractions on the trail we chose: Calypso Cascade and Ouzel Falls. We decided to eat our “lunch” (snack food mostly) when we reached the Falls. On a warm August day, there were several other hikers. Not too crowded so that the hike wasn’t enjoyable, but you’re may have to wait your turn to take a photo with the popular cascade. We also chose to eat our snack at the Falls rather than here because too many other people chose this spot for lunch. The Calypso Cascade is approx. 1.8 miles from the ranger station at the beginning of the Wild Basin Trailhead. If you didn’t get your fill of rushing water from the Cascade, keep hiking towards the Ouzel Falls. It’s about 1 mile further from the Cascade (2.7 miles from the ranger station). We followed other hikers to figure out how to get the best spot to see the falls. It wasn’t a very clear path through the trees. We sat on a fallen tree for lunch after taking some photos. It was a short hiking day for us. We didn’t want to stay on the mountain too long and we were still sore from hiking the Grand Canyon the day before. On the way back down we spotted an elk but it was moving way too quickly for me to take his picture. But keep an eye out while you’re hiking on all of the trails in and around the Rocky Mountain National Park for wildlife. We drove up the Old Fall River Road to the Alpine Visitor Center on both of our visits. On the way back down we took the Trail Ridge Road. The Old Fall River Road is a dirt road, one-way, and used to be the way visitors accessed the park. Now, you can only take the road up to the Alpine Visitor Center. Make sure you’re driving a vehicle that can handle the narrow, dirt road with occasional sharp turns. We drove up the road in my Hyundia Sante Fe the first year and a Toyota truck this last time. Along the drive there are a few trailheads and creek beds that you can explore. I suggest looking them up ahead of time, and starting early in the days if you plan on hiking any of these spots. You can click here for information on how to find these trails, including Chasm Falls. There isn’t a lot of space for cars to park on the side of the road, so usually only 3-5 cars can park near a trail head. This road is not open year-round, so if you’re visiting in fall and winter, it is likely closed. The reason is because weather can be unpredictable in the Rocky Mountains. On our first visit, it was in the 70’s in Estes Park, but it was 50 degrees and drizzling at the Visitor Center. Once you drive above the tree-line, you can see the Alpine Visitor’s Center. There are two “hill tops” you can hike near the Visitor Center. The first is before the final ascent to the visitor’s center and has a pull-off where you can park (the photo above on the right). You’re likely to see other cars parked here, so that will let you know you’re in the right place. On our first trip, it was sunny in Estes Park but drizzling and 50 degrees at the visitor’s center. I couldn’t actually see the top of the hill. We luckily had jackets and rain coats in our car. Since I had no desire to hike to the top in the cold rain, I took a few photos of marmots and the fog over the Rocky Mountains while my fiance hiked up real quick. On our second trip, we were blessed with warm, sunny weather! And marmots, of course. It doesn’t seem like a difficult hike, but when you’re first getting used to the elevation you’ll find yourself taking a few short breaks. Its also steeper than it appears. The elevation at the Visitor Center is 11,796 feet. The second hike is across from the Visitor’s Center and is more crowded than the first. I haven’t done the second hike. It was too cold and rainy the first trip and this last time, we were already tired and ready to get dinner so we skipped it. My fiance’s mom dropped us off for the short hike and she went to find parking at the visitor center. There’s a good chance you’ll have to make a few trips around the parking lot before you find a space. There’s a lot of visitors throughout the day, with people constantly coming and going so you just have to wait a few minutes before someone leaves. At the Visitor Center you’ll find a museum with information about the region, a large gift shop (I bought a coffee mug), and restrooms. You can buy food at the gift shop, too. There’s a separate building for restrooms, too. I think there’s actually two entrances for the women’s restroom, so if there’s a long line keep looking for another restroom. I waited in the cold on our first trip then was informed by other women that I could’ve skipped the line. You can also buy food in the gift shop. On your way down, you’ll take the paved road. There’s several places where you can pull off to the side of the road for scenic views. Please stay on the paths! We saw several people walking on the grass instead of the clearly marked trails. It’s important not to trample the vegetation. We also saw people getting extremely close to elk. Not only is this not a very safe decision, but it also meant they were wandering off the clearly marked paths. Please respect the fragile ecosystem and wild animals in the Rocky Mountain National Park. For our 2017 stay at Estes Park, we stayed at a family friend’s cabin. But our previous visit was spent at Mary’s Lake Lodge. In August 2016, we stayed at Mary’s Lake Lodge. This rustic hotel opened its doors in 1913 as the Estes Park Chalet. It has seen many different owners and has fallen in and out of repairs. It became Mary’s Lake Lodge in the later 1980’s. It became the lodge we know today after the current owner purchased the nearly-renovated building in 2013. The Tavern 1929 and restaurant was added a year later, and today its a great spot to rest your tired feet after hiking all day and enjoy a glass of craft beer. The lodge’s location offers great views of the lake and the town. There is hardly any light pollution in the city so at night you can look up and still see plenty of stars. Some of the cabins on the lodge property have hot tubs on their patios. We took full advantage of this during our stay sine we were so sore after hiking the Grand Canyon. Okay, we didn’t stay here. But if we could, we probably would. Maybe one day. This luxury hotel first opened in 1913, thanks to Freelan Oscar Stanley who fell in love with the wilderness but longed for his East Coast lifestyle. By the 1970’s the hotel lacked the care needed to uphold its former glamour. Then Stephen King stayed at the Stanley Hotel and inspiration struck. His novel The Shining was inspired by his one night stay at the Stanley. Today, back to its former glory, it’s idyllic location and architecture make it a popular spot for weddings. Located in the heart of downtown, across from Bond Park where Farmer’s Markets are held, Claire’s Restaurants is the perfect place to grab breakfast. The portions are large, filling, and very tasty. If you like mimosas or other boozy brunch drinks, this is the spot for you! This Italian restaurant was a recommendation from our family friend who owns a cabin in Estes Park. It looked like a place where the locals gathered for dinner with friends. It had that small town, locally-owned vibe to the place. Its located at 430 Prospect Village Dr, next to Fun City. If you can grab a table on the porch, you’ll have a nice view of the Big Thompson River. We ate here the night before our summit hike. The tiramisu was very good. If you’re looking for Mexican food and in the downtown area, check out Ed’s Cantina. It’s located at 390 E Elkhorn Ave. We ate here with my fiance’s family on our first night in Estes Park. There was a bit of a wait for a table, but there are plenty of artisan shops next door for us to walk around in as we waited. This cafe is located in the Stanley Shopping Center at 459 E. Wonderview Drive, next to the True Value. We stopped here for a big brunch before driving to the Alpine Visitor Center. Here are affiliate links to the gear that I used on this trip. I chose this backpack after trying on several types at REI. Your pack should fit you in a specific way so that the weight sits on your hips. I recommend trying your pack on before buying. But feel free to buy online after that. Using one of my affiliate links will not affect your cost, I will simply receive a commission. Though I purchased the gloves, I never got to use them since I forgot them on the morning of our hike. I highly recommend the water bladder. Its easy to fill and use. I wore a similar pair of sunglasses on the mountain. They came in handy while sitting at the key hole for several hours. If you do not purchase these, make sure you buy polarized sunglasses that fit close to your face to not only block out the sun, but also because they’ll be less likely to fall off. I have no complaints about the trekking poles. 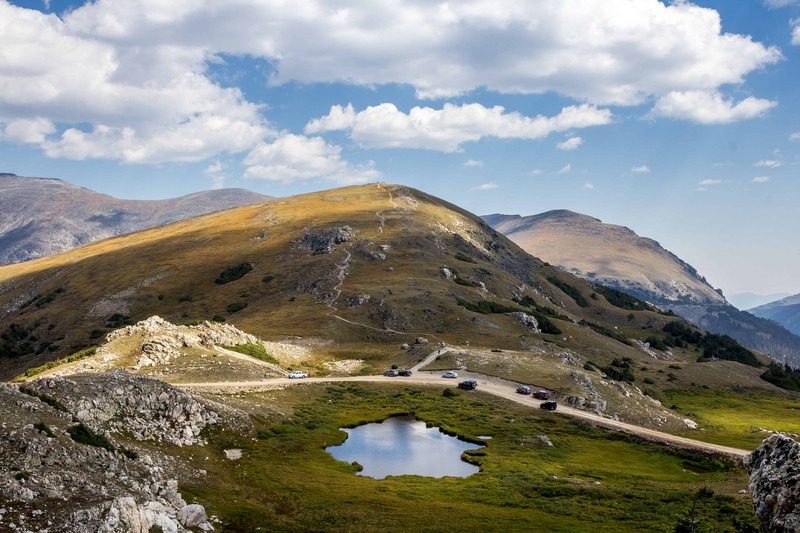 Have you been to the Rocky Mountain National Park? What is your favorite area of the park? Favorite hikes, lakes, sights? Share in the comments!